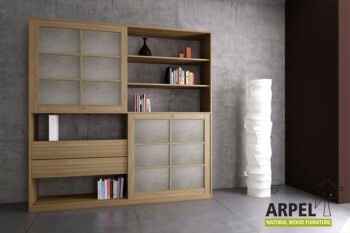 The Quadro Bookshelf with Fabric is particularly versatile. It is devided into two sections with sliding doors, has drawers and an open module with shelves. With its symmetric disgn it adapts to any living ambience. The four multifunctional sections offer perfect storage space for any type of items. The Quadro Bookshelf Rice Paper is particularly versatile. It is divided into 2 sections with sliding doors and 2 sections with drawers and shelves. With its clean and symmetric design it is perfectly suitable for any living ambience. The four multifunctional sections are also perfect to store kitchen utensils.